The rebels need better trainers, before it’s too late. They march in place as a drill sergeant barks commands. They simulate shooting 106-mm guns in a concrete lot. They practice charging enemy buildings. They are giving it their all, but they resemble high school freshmen learning to march on their first day of band practice. Meet the recruits who hope to overthrow Libyan leader Muammar Qaddafi. Though they might have the resolve necessary to make good fighters, their fly-by-night training is too brief, and it does not stress the combat fundamentals required to produce properly trained soldiers. When I visited the February 17th Martyrs Brigade Camp at the end of May, recruits waiting to be processed sat in the shade nibbling on biscuits, while vintage school buses from the 1970s rumbled through the gate. A former Revolutionary Guard base that was transformed into a rebel training camp about 10 days after the uprising in eastern Libya, the camp has trained hundreds of Libyans eager to fight Qaddafi’s forces. Only 30 to 40 percent of the camp’s graduates will ever see the front. The rest will drink tea and smoke cigarettes while guarding key civilian installations such as hospitals and hotels. One lesson that I witnessed involved an instructor giving a crash course in the use of a 106-mm recoilless anti-tank rifle. “What is a tank?” he shouted out, beginning the lesson. As he explained the finer points of the weapon’s specifications, his students responded with puzzled looks and giggles. Some eventually lost focus and began tapping their cell phones. Others smiled at a visiting foreigner and asked how they could reach The New York Times. In another part of the camp, an instructor, who gave his name as Nuri Tawil, taught recruits to charge an enemy building by looking for cover to block opponents’ fire. Tawil, who uses a pseudonym to prevent retaliation against his family from Qaddafi supporters, illustrated how soldiers should extend their weapons around building corners to shoot without exposing themselves. After finishing his short demonstration, he asked for volunteers. The first to try to simulate Tawil’s deft maneuvering tripped over his untied shoe and fell. Later, one of the instructors at the February 17th Martyrs Brigade Camp, a former Libyan officer, explained his frustrations with the fresh crop of recruits. “It usually takes three to four months to train soldiers how to use these weapons. But we don’t have that kind of time. We ship them out of here in three to four weeks with only the most basic grasp of combat,” said 63-year-old Abd Al Salam Benghazi. Like all the instructors, he uses a pseudonym when speaking to journalists. The trainers, however, are part of the problem, too. Most of them retired from active service in the late ’80s and early ’90s after fighting in Libya’s disastrous campaign in Chad, which lasted from 1978 to 1987. (In 1987 alone, Qaddafi’s forces lost 7,500 soldiers to the less-equipped and smaller Chadian army.) Others say they were taught by American mercenaries who fought in Vietnam. (In a 1981 two-part article in The New York Times Magazine, Seymour Hersh described Qaddafi’s hiring of retired United States special forces soldiers and former Central Intelligence Operatives in the 1970s.) This motley experience makes the men now training the rebels inadequate, if well-intentioned, teachers. They have not been active soldiers for more than 20 years; they do not know the latest combat techniques and have not practiced their limited skills since they retired. Former U.S. Army Ranger Matt Larsen, who is in Libya independently to assess the rebel army, confirms that the bare-bones training that recruits receive does not address their needs. Larsen, who trained soldiers in both Iraq and Afghanistan after fighting in the 1991 Gulf War, notes, “They don’t know the rudiments of how successful attacks and defense are mounted.” What is more, the rebels’ instructors overemphasize weapons-handling and neglect topics such as survival techniques and teamwork. “Half of what you spend learning is how not to shoot your own soldiers. Without these skills, the rebels will be fodder for Qaddafi’s long range artillery,” Larsen explains. Better training, Larsen believes, will necessitate Western instructors—three to four teams of twelve-man special forces units, which could train between 1,800 and 3,200 rebels. At the moment, though, the Western role has been strictly limited to bombing Qaddafi’s forces from the air. Larsen’s gloomy assessment of the immediate problems facing the rebel troops dovetails with a broader analysis of Libya’s historical military effectiveness written by Brookings Institution fellow Ken Pollack. In his book Arabs at War, Pollack notes that Libyan troops who fought in Chad could not coordinate between brigades and were limited by “tactical ineffectiveness.” The lack of “unit cohesion” that so plagued Libya in its last war is the bane of the current recruits. And this shortcoming stems in large part from what today plagues the rebels: a lack of adequate training. Pollack describes Libyan past methods as “unrealistic, incomplete, and perfunctory.” In a recent report about North African armies, Anthony Cordesman echoes Pollack’s conclusions, remarking “even [Libya’s] best combat units are under-strength and have severe training and leadership problems.” While these shortcomings are a hallmark of Libya’s armed forces in general, the rebels—with their out-of-practice instructors—are worse off than the Qaddafi’s Libyan army. What the current recruits need now are not instructors steeped in Libya’s historically ineffective practices, but professionals who are skilled in advanced combat techniques—trainers from exactly those Western countries who have been reluctant to commit troops to the Libyan campaign, and have instead limited their contributions to air support. 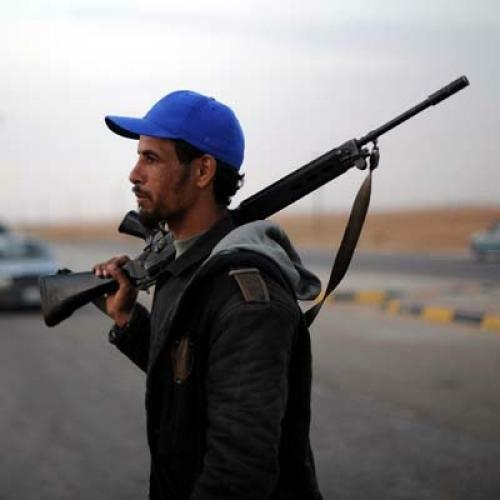 With the eleven-week NATO bombing campaign failing to dislodge Qaddafi’s forces from their entrenched positions in the city of Brega, the rebels’ only hope of toppling the Libyan leader lies in creating a skilled fighting force. But their archaic trainers and inefficient combat methods renders such a scenario increasingly remote.